Massage therapy has been used by millions around the world. There are many types of massage therapy for a variety of health-related purposes. Massage therapy is often considered part of complementary and alternative medicine for relaxation, pain, inflammation or recovery from injury or workouts. Dating back thousands of years, references to massage has appeared in writings from ancient China, Japan, India, Arabic nations, Egypt, Greece (Hippocrates defined medicine as "the art of rubbing"), and Rome. The term "massage therapy" encompasses many different techniques where therapists would press, rub, and manipulate the muscles and other soft tissues of the body by using their hands and fingers, forearms, elbows, or feet. A typical massage therapy session often involve the manual manipulation of muscles, connective tissues, tendons and ligaments to enhance a person's health and well being. 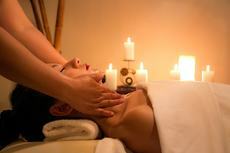 Many people also prefer a massage to relax, reduce stress, and relieve muscle soreness. Massage therapists work in a variety of settings, including private offices, hospitals, nursing homes, studios, and sport and fitness facilities. Some also travel to patients' homes or workplaces. They usually try to provide a calm, soothing environment and can apply quite a wide range of techniques. Every therapist uses a different touch, but most therapists use their hands and fingers during the massage. The type of massage you get depends on your goal. While some massage therapists can offer many types of massages, some states may require certification to perform specific types of massages because the massage has a specific purpose. Therapists usually ask new patients about symptoms, medical history, and desired results. They may also perform an evaluation through touch, to locate painful or tense areas and determine how much pressure to apply. Typically, the patient lies on a table, either in loose-fitting clothing or undressed (covered with a sheet, except for the area being massaged). The therapist may use oil or lotion to reduce friction on the skin. Sometimes, people receive massage therapy while sitting in a chair. A massage session may be fairly brief, but may also last an hour or even longer. Swedish Massage: As one of the best-known type of bodywork performed today, the primary objective of a Swedish massage is to relax the entire body. This is accomplished by rubbing the muscles with long gliding strokes in the direction of blood returning to the heart. By using their hands, fingers, forearms or elbows to knead, stroke, vibrate and tap the area, the therapist aims to stimulate the blood in the area. Trigger Point: Also known as muscle “knots” are sensitive spots in soft tissue. This type of massage pinpoints areas that tend to radiate pain beyond the pain site. The therapist applies pressure to the area where the pain is strong, from a few seconds to a few minutes. In this type of massage for trigger point therapy, the recipient actively participates through deep breathing as well as identifying the exact location and intensity of the discomfort. Deep Tissue Massage: Somewhat similar to Swedish massage, deep tissue massage uses deeper pressure to help release chronic muscle tension. The therapist focus is on the deepest layers of muscle tissue, tendons and fascia (the protective layer surrounding muscles, bones and joints) by massaging the area with deep pressure to melt knots and tension from stress and discomfort. Shiatsu: In shiatsu therapy, pressure with thumbs, hands, elbows, knees or feet is applied to pressure points on the body. This form of massage also focuses on rotating and stretching limbs, joints, and pressure points, or meridians. This massage originated in Japan where the therapist uses his or her thumbs, fingers and palms on the main acupressure points. Watsu: Watsu is a gentle form of body therapy performed in warm water, (around 35°C.) It combines elements of massage, joint mobilization, shiatsu, muscle stretching and dance. The receiver is continuously supported while being floated, cradled, rocked and stretched. This massage is administered in a pool and is a variation of a shiatsu massage and uses acupressure and meridian stretching techniques. Foot massage: A foot massage is a simple, cheap and effective method to relax your body and mind. It is based on the tenets of foot reflexology and involves applying pressure on key points in the foot to get benefits. Practiced in many cultures for centuries to promote health and well-being, foot massage today is considered a complementary and alternative medicine used by millions to relieve pain, reduce stress and anxiety, rehabilitate injuries and boost general health. Advanced Therapy Solutions was founded in 2003 by Dillen Hartley, OT, and Niel Visser, PT. Headquartered in Spartanburg, South Carolina, ATS is an independent, therapist-owned outpatient provider of physical and occupational therapy. The perfect getaway for everyone who are visiting Chiangmai. Discover the true wellness experience. The Best Yoga Studios in London. ... Free-Movement Bioenergetic yoga therapy sessions, and a pre and post-natal series, which includes Mum & Baby classes. Welcome to The Yoga Barn – Ubud, Bali "The Yoga Barn is a gem in a sacred paradise. ... Acupuncture, Craniosacral Therapy, Naturopathy and much, much more. City Square Mall is a family-friendly mall and home to some 200 retail, entertainment, lifestyle and F&B stores, catering to the lifestyle needs of everyone in the family. Comprehensive listing and links to yoga classes, yoga studios, yoga centres and yoga teachers in Singapore. We also provide the latest info on yoga events, happenings, workshops and retreats in Singapore.